Mr. and Mrs. Norman Foster of Snyder celebrated their 60th wedding anniversary in February with a party and musical entertainment by Gregg Sansone for family and friends at Sloan Fire House in Sloan. 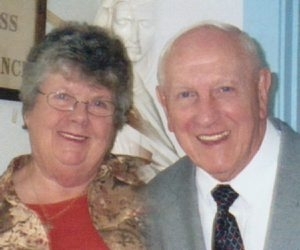 Mr. Foster and the former Nancy Maney were married Dec. 26, 1953, in Endicott. He is a retired physical education teacher and coach for Iroquois and Amherst Central Schools. Mr. Foster set a New York State record for 150 consecutive wins, and eight straight sectional championships during his wrestling coaching career at Iroquois. He has been inducted into the Iroquois High School Hall of Fame, New York State Wrestling Coaches Hall of Fame and the National Wrestling Hall of Fame. He was ordained into the permanent deaconate of the Diocese of Buffalo. She is a retired physical education teacher and coach for Christ the King School. They have six children and 21 grandchildren.